I love snow! It brightens up a dreary winter and makes me feel happy. Normally. But wouldn’t you know it, this morning, on the 4th anniversary of my mother’s passing, I woke up under 10,000 pounds of sorrow, as if the foot of fresh snow we’d received had collapsed our roof and was now crushing my heart. R’s comforting words or his offer of making a nice breakfast of yogurt and marionberries with granola didn’t help. Who can eat her way through grief? Mary, my mom, was a Quinn and Irish to the core. 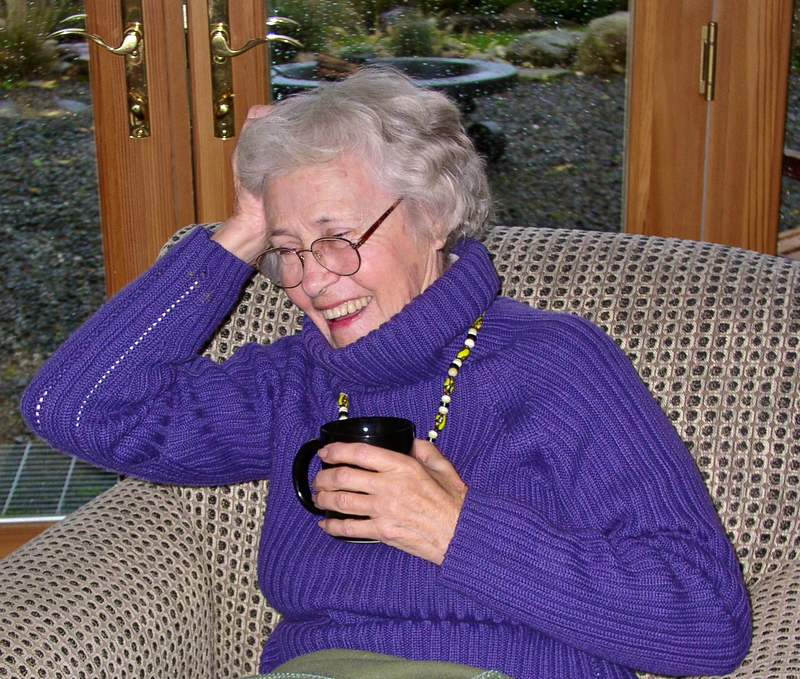 Instead hanging out in bed weeping like me, she would have insisted on a mug of coffee with a shot of Bushmills on the front porch loveseat, tossing toast onto the snow for the crows and and a default recital of Longfellow’s “A Psalm of Life,” which Sister Mary Michael had encouraged her to memorize as a young girl at Mount St. Joseph in Owensboro (and which Mom had lovingly referred to as “The PIZZ-alm”). But it was too early to drink, so I switched to Plan B, a steaming bubble bath with Mary Oliver. Fortified by a double dose of poetry, I had a playful vision as I soaked, beamed, no doubt, by my mom who before she died told me, “Just as the Virgin Mary appears as the scent of roses when we say the Rosary, dear, I will let you know when I’m around by the same heavenly smell.” And soon she was right there in the bathroom, my mom, as essence of rose growing stronger with each inhalation; so strong, in fact, that I had to take a couple of puffs from my inhaler! And then, not surprising since we both adore them, she channeled (I guess that’s the word) a mental picture to me of a snow raven. “Okay, Sweetheart, have fun!” he called back, as though this was something I did every day. I gathered my mother’s faded brown gardening hat, her purple plaid scarf from Ireland, and headed out the door. 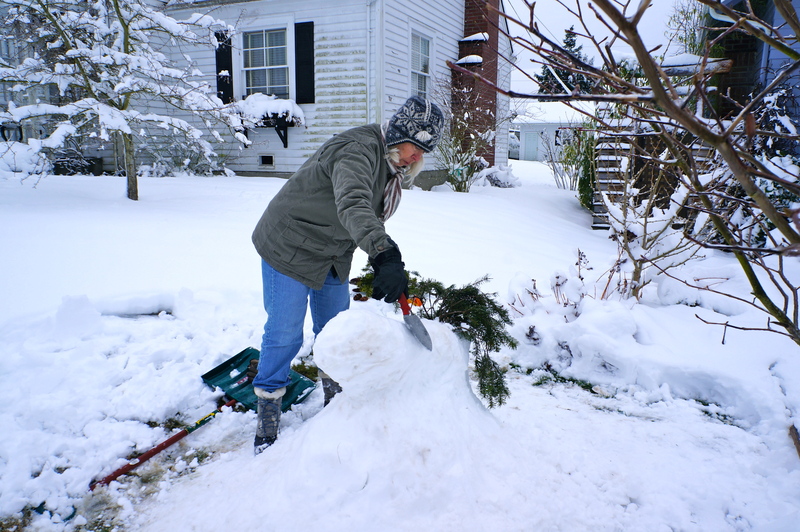 In the garage I found a shovel and trowel that might come in handy, and from the ground a handful of fallen fir boughs that could be useful as feathers. Out front, I was greeted by a flurry of crows squawking disapproval that I was making a snow raven instead of a snow crow. Eventually, R, sensing that I might be going off the deep end with this snow raven business, appeared snow shovel in hand, which was good because I’d started crying again and it was damn near impossible to see my work through the blur. Plus, I was getting cold. We worked for another hour or so until we’d achieved what looked more or less like the image I’d seen in the bathtub. 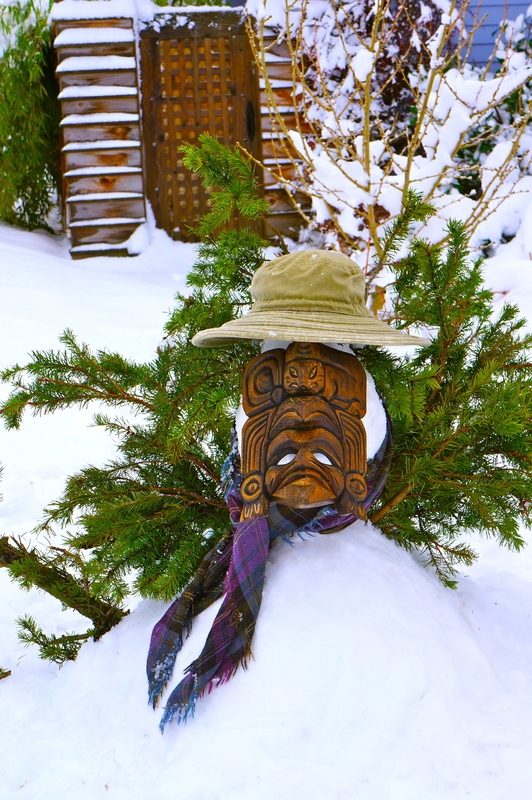 The crows had quieted down, by then, and seemed to approve of what I now realized was a totem to my beautiful mother, significantly enhanced by the addition of a carved raven mask from Salt Spring Island that I’d found half-hidden under the snow in the garden. R added a final fir bough feather to one of the snow raven’s wings, and then we headed back into our cozy house. What a lovely post. So touched by your thoughts of your mom, the snow and everything. Thanks for including the poetry, too. Thank you, Rusha! So pleased that you enjoyed it. All the best to you. Great story Susan. beautiful! truly beautiful! Thanks, Boosie, and congratulations on your many recent successes! What a lovely way to remember your mother! I too love snow and also Mary Oliver– ah to write like her. I think we’re done with snow now in the NE.. but you never know. Thanks, love. Mary for Mary, eh? 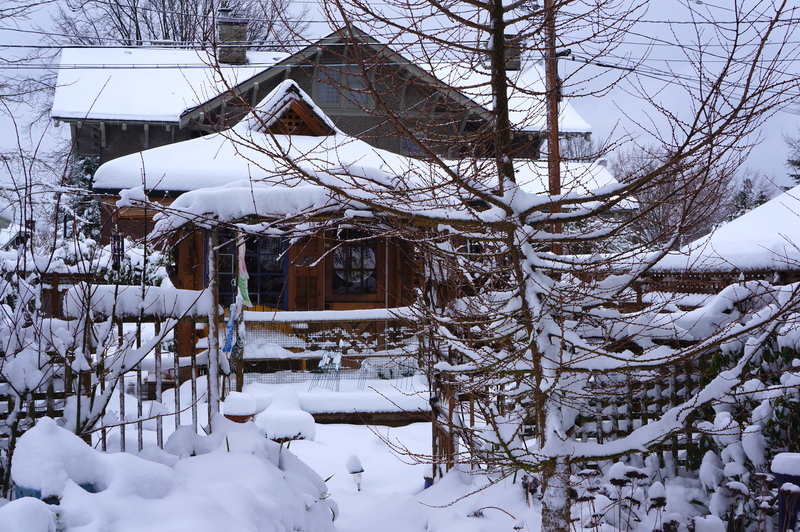 About the snow, it was a HUGH surprise for our Pacific Northwest town, not so much that it snowed, but the quantity. Wow! No wonder you write magical realism … you live magical realism! A beautiful tribute. Susan, what a great tribute to your mom–this is lovely. You evoke the sadness and your love of her so well. Thank you, Pam. My mom was quite an amazing person, and I sure do miss her. Hugs. I was just at the ferry terminal listening to Cheryl Strayed talk about her book and the loss of her mom. Moms are visceral, powerful parts of us. For me, contains a sweetness and an intensity—also an easy intimacy hard-earned–with one’s landscape—personal and geographical. The voice had a matter-of-fact quality–like we, the reader, were being goaded along for a ride–and where we ended up is not where we began–which leads me to feel that you instead guided us on a journey—home. Blessings to you, your mom, R–and the snowy raven. Thank you, as always, for kindling within us a magical relationship with the supernatural sides of existence. You know, dawg, I appreciate your kind words, as always. It’s a profound experience allowing the Mystery in, going along for the ride and then somehow sharing it using words and pictures which evoke only the tiniest glimpse. Blessings back on you and your family, including your mom. PS) amazing how much you look like your mother! You both have that incredible smile! One of the many things I adore about you. What a beautiful tribute to your mom and a way to keep her memory present and joy-filled. You might have more snow on your roof than I do, by the way. Thanks, Laurel. Not anymore, but I hear we might be getting another dusting this weekend. Hola Sandra! Ah, your mom’s passing is so fresh. How are you doing? 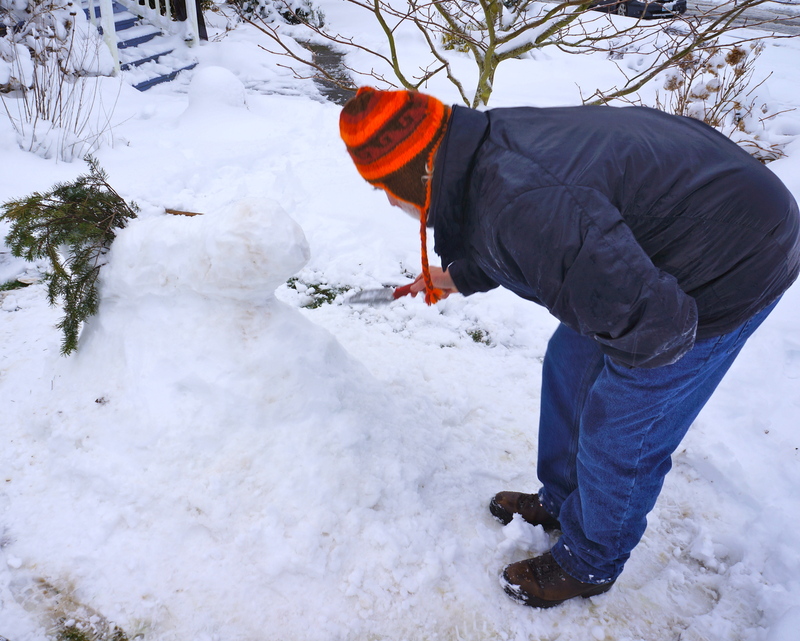 The snow eventually melted as our weather in the Pacific Northwest has warmed a bit. I pinched tips off the Douglas-fir “feathers” and made tea, which was delicious and completed the process, I think. Sometimes we just have to follow our hearts…maybe always. Thanks for your comment. Doing okay thanks, Dad died March, Mum died May, so this is the season of remembering them. It’s the odd little things, isn’t it? I’ve never had fir ‘tea’, sounds fascinating! SD … oh and thanks for following my writing blog too! Yes, it is the little things. Sometimes I’m out in the garden and the scent of oregano or sage will waft by and at the same time I feel my mom’s tiny hands touching mine. What a gift! Losing both parents so close together is hard on the heart…so sorry. It’s really hard to believe that is your writing studio in the photo. S., you have an incredible eye for composition and detail. It’s also incredible how there is a huge color-connection between the lovely photo of Mary and the studio; the color of her sweater really pulls at the blue in the photo. A beautifully written, endearing and memorable story of a lovely lady! ❤ U, R.
Thanks for sharing this little poem, GS! Always inspiring to see someone enjoying life out loud. Thank you, EME. I appreciate your take on it. Thank you, Sartenada. Snow and sorrow are a good combination.